The Ritz-Carlton Rewards program has put on a new promotion that will help you earn free Ritz-Carlton gift cards. Well ok, its not exactly free a gift card worth a couple hundred will not exactly make a big dent in your bill for 5-10 days at the Ritz-Carlton but its something. 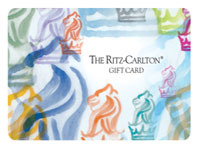 If you are already planning an extended stay then why not take advantage of the free Ritz-Carlton gift card promotion? All you need to do is sign up for the Ritz-Carlton Rewards program, its free to sign up and each stay will earn you points that can be redeemed at 33 air carries or any one of the Ritz-Carlton’s 3,300 partner hotels located across the globe. Once you have signed up you will also receive a $100 Ritz-Carlton gift card for any 5 day stay at a Ritz-Carlton hotel. Stay 10 days and you will earn yourself a $250 Ritz-Carlton gift card.The promotion is running until June 30th, 2011. The Ritz-Carlton gift cards can be used for a number of things including dinning in famous chef’s restaurants, relaxing in one of the Ritz-Carlton’s famous spas, or playing 18 holes on a PGA golf course. If these lavish activities don’t do it for you or if you wallet is feeling a little light after your extended stay you can also consider selling your Ritz-Carlton gift cards on Giftah.com. It’s easier than checking in at the Ritz-Carlton and you can turn your gift cards into cash in less than five minutes. Just send in your card and you will receive payment as soon as the balance is verified. It’s a great way to get ride of something that is likely to sit around gathering dust for years. It is that time of the year where retailers are busy offering discounts and deals to celebrate the holidays. Dell is no different and is currently offering $50 when you purchase anything on their website worth $599 or more and pay using PayPal. Combine this with Giftah’s awesome Dell discounted gift cards and you can save hundreds of dollars on your favorite laptop this holiday season, or that perfect home theater system you have been dreaming about all year long! Do you want to wake up to a free breakfast? No need to worry about what to eat and what to make when you get up in the morning as Kellog is currently giving away a free breakfas when you collect 5 FREE product coupon inside Kellog cereal. 1 coupon is printed on each specially marked box of Kellogg’s* cereal. - FREE Kellogg’s* cereal: Redeem towards 1 FREE box of Rice Krispies* Original cereal (525 g), Froot Loops* cereal (380 g), or Corn Pops* cereal (345 g). - FREE 1 Litre of Milk: Redeem towards 1 FREE litre of milk (includes Skim 1%, 2%, 3.25% Homogenized) products to a maximum value of $2.69. Offer excludes 250ml, 500ml, 2L and 4L regular, premium and specialized milk and soy milk products. Milk offer not valid in Quebec, Nova Scotia, New Brunswick, Prince Edward Island, or Newfoundland. - FREE Minute Maid® Concentrate: Redeem towards 1 FREE can of Minute Maid® Frozen Concentrate (355 ml). - FREE Danone® Yogurt: Redeem towards 1 FREE tub of Danone® Creamy Yogurt 750 g or 1 pack of Petit Danino Yogurt (6 x 60g). - FREE Bananas: Redeem towards up to 2 lbs of bananas up to a maximum value of $1.69. Buffolo is having a hot deal now until December 25th: buy any gift card for 20% off – just use coupon code GC12 for the discount! Gift cards are available in $50, $100, $150 or $200 denominations and there doesn’t appear to be a limit on the number of gift cards you can buy with this promotion. To top it off, all gift cards come with free shipping. Enjoy! The festive season is definitely here now and all the retailers are taking full of advantage of it! Ticketmaster is no different as they have just announced six days of deals. Don’t forget to combine these savings by buying one of our discounted gift cards for ticket master. The cards are sold directly by Giftah, so you can be sure they are fully verified and their balances are 100% guaranteed. The cool thing is you don’t have to wait for auctions to be over, you can buy the Ticketmaster gift card right away from Giftah! The six days of deals seem to be for Canadians only at this time but chances are more deals will be coming up for our American friends soon.